This page has printable reminder wristbands for your students. Help them remember library books, bus numbers, lunch money, homework assignments, field trips, tests, and more. Use these paper wristbands to remind children to bring their library books back to school. A printable set of bracelets with a note to remind students to correct and return a test. 12 reminder bracelets you can print and fill in bus numbers on to help students remember. A set of printable field trip reminders in the form of bracelets. Students sometimes forget lunch money. Next time one of your students doesn't have money for lunch, use one of these bracelets to help them remember. 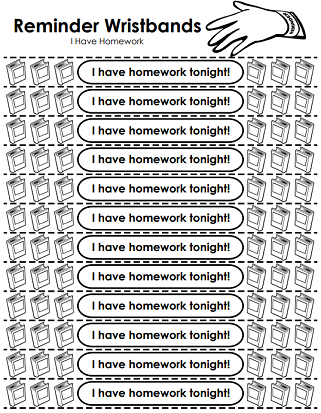 Print this set of 12 "I have homework tonight" bands to remind students and parents about assignments. A set of reminder bracelets that let parents know that homework wasn't handed in and that it should be brought in tomorrow. A set of 12 printable bracelets students can wear home to remind parents to sign their agenda books. Use these 12 cut-out wristbands to let parents know your student has a note from you. Award Wristbands - Awesome Job! A set of 12 printable award bands that say, "Awesome Job!" Award Wristbands - Happy Birthday! "Happy Birthday!" written on 12 cut-out paper bracelets. Give out these 12 printable bands to your Super Helpers! Award Wristband - Super Star Student! 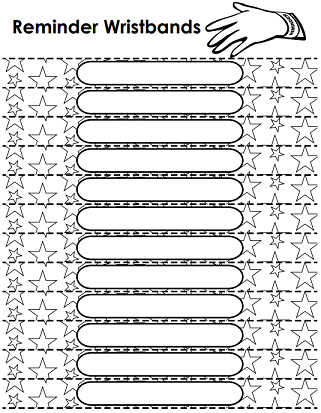 Students can wear these printable cut-out wristbands to proudly show they are a "Super Star Student!" Award Wristbands - Way To Go! 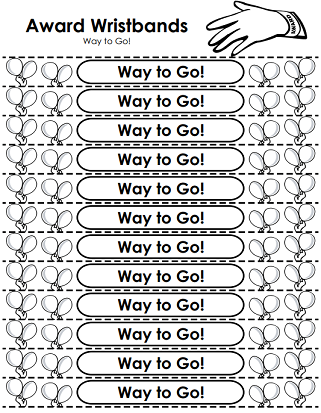 A set of 12 printable award bracelets that tell the student "Way To Go!" Write your own reminders or awards on these printable wristbands. This file has twelve bracelets. There's a blank space for the teacher to write a message and a background with stars. Write your own reminder messages to students on these cut-out paper reminder wristbands. This set has balloons on the background. 12 bracelets to cut out and write reminders for students, feature a background image of books. With a background images of buses, this set of wristbands can be printed and written on as a reminder for students. A set of 12 printable bands to cut out and write reminders on, with a flower themed background image. Download and print teaching tools, such as gradebooks, lesson planners and student agendas, sticker charts, and blank calendars. Printable awards for student. Includes: honor roll, super readers, character awards, and more. Logged in members can use the Super Teacher Worksheets filing cabinet to save their favorite worksheets. Quickly access your most used files AND your custom generated worksheets!